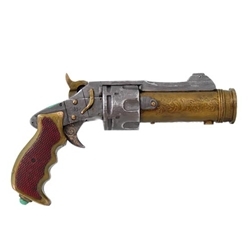 This Steampunk Pistol is made from cold cast resin and hand painted. Intended for display, it measures approximately 8 inches long. The Annihilator Mark II is made from cold cast resin and makes a beautiful display piece. Measures 29 inches long, 9.5 inches tall, and 3.75 inches wide. Affectionately known as the Steampunk Big Daddy, this cold cast resin collectible measures 11.25 inches long. The Steampunk C.O.D, or Concealable Ossotronic Disruptor, is small enough to tuck away in a handbag, muff or garter at 5.75 inches long. Made from cold cast resin and intended for decorative use. The Steampunk Combobulator features the newly patented Fission Fed Cartridges from CJF Industries; offering you, the discerning customer, an experience like no other. Made from cold cast resin, 10 inches long. The Steampunk Consolidator is a MK.I model, utilizing and advancing the technology of the Resilient Valve, it offers power but with grace. Like our C.O.D , it is an ideal size for concealment. The Steampunk Liberator Mark III is made from cold cast resin and has been rendered safe for display. Measures approximately 7.5 inches long. Sleek, small, and above all else a dastardly powerful little beggar. If small is indeed the future then the The Steampunk Thresher Mark II Ionizer personifies it beautifully. Hand painted, made of cold cast resin, and measures approximately 7 3/4 inches long. The Steampunk Vaporizer is made from cold cast resin with hand painted details. Measures approximately 7 inches long, for decorative use.